LEGO City is a realistic LEGO world full of adventure, with countless details waiting to be discovered. Popular vehicles and buildings set the stage in this exciting city, where everyday heroes catch criminals and put out fires. The LEGO City world has been designed with humour and charm in order to get little builders thinking as creatively as possible. 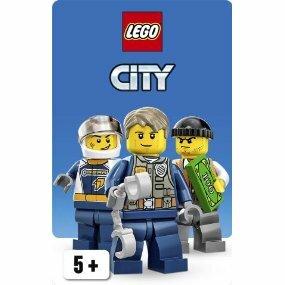 LEGO City reproduces all the elements that your child sees in everyday life into iconic models that will encourage them to create a city full of action, humour and charm. All of the key themes are here for many hours of play, from the police and fire brigade to the many cool vehicles and iconic buildings that your child will love building and playing with. There is rich detail in LEGO City to really fire their imaginations, so this is a world of endless variations. LEGO City is an open-ended world of opportunities which will make their play much more varied and more fun, too.